Posted on January 23, 2018 at 1:43 pm. The Hyb-Man project was presented at EFECS 2017 (5-7 December 2017) in Brussels. The EFECS, European Forum for Electronics Components and Systems, is organized by AENEAS, ARTEMIS-IA, EPoSS, ECSEL Joint Undertaking and the European Commission. The focus of this international forum was on ‘Our Digital Future’ along the Electronic Components and Systems value chain in Europe. 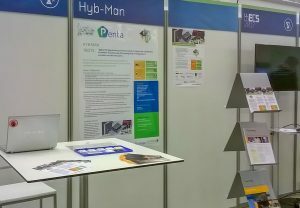 A poster, information flyers and first examples of combining 3D Printing with Printed Electronics were presented at the Hyb-Man booth. The event offered great opportunities to engage in technology roadmap information sharing and collaboration building through pitches, posters and presentations. 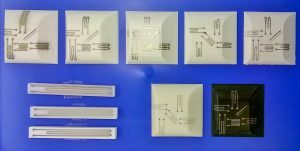 Study of printed conductive track quality on FDM parts with different surface treatments.